Behind the Nelson House is a full-scale authentic reproduction of a Ferry Boat. A commercial ferry was first operated here in the 1740s, built by Garrett Jansen (the name was later anglicized to Johnson) to support his large family. The boats that he operated were likely very similar to this, with ramps that were raised and lowered on either end to allow for horses and carriages as well as people. 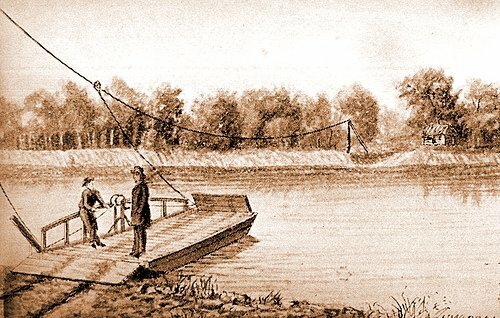 Some ferries were propelled by poles or by rowing, but it is likely that a ferry in this section of the river was strung along a rope and pulled across. In 1776 the ferry was operated by James Slack, who allowed General Washington and his troops to transport 18 cannons using his boats on that fateful Christmas Crossing. An sketch of a ferry in action. To learn more about ferries, visit www.living-in-the-past.com/ferry.html.